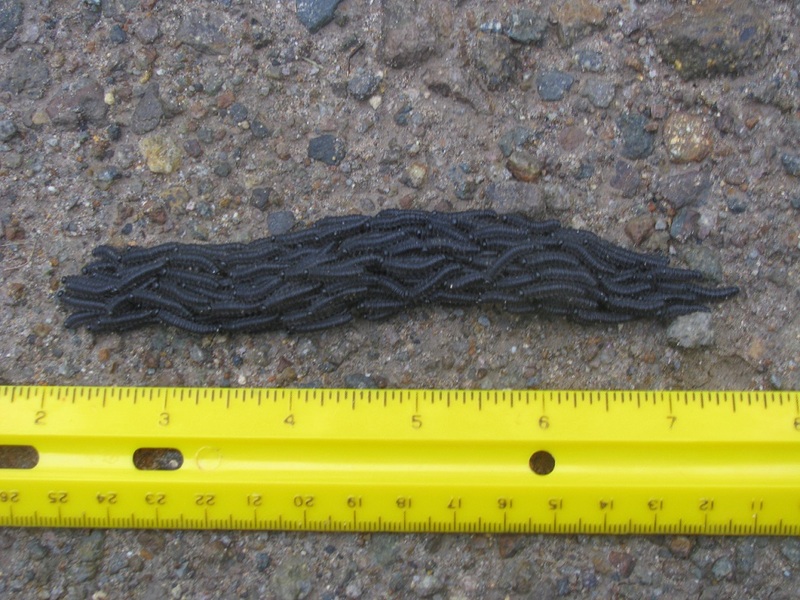 Spouse was out walking this morning and saw what appeared to be worms (on closer inspection, they seem to be millipedes), swarming together, travelling across a small dirt road. It seemed uncanny the way they seemed to be so coordinated in their movements. A neighbor has seen similar swarms -- or maybe the same group? -- in the same general area. Looks like millipedes to me, Gayle. I'm guessing what you photographed is either a breeding swarm or, more likely, a clutch of juveniles traveling together for protection by appearing to be a larger organism. I just asked Jorge, and he said he doesn't know what they're up to, but that yes, he's seen that before, so I guess it's not uncommon here. Interesting! But ick. Well Tiffany, at least they don't seem to be threatening people and they're not slimey, two good things, but wait 'til they grow up... At least they still won't be slimey and I doubt they'll threaten people. Here's why . . . 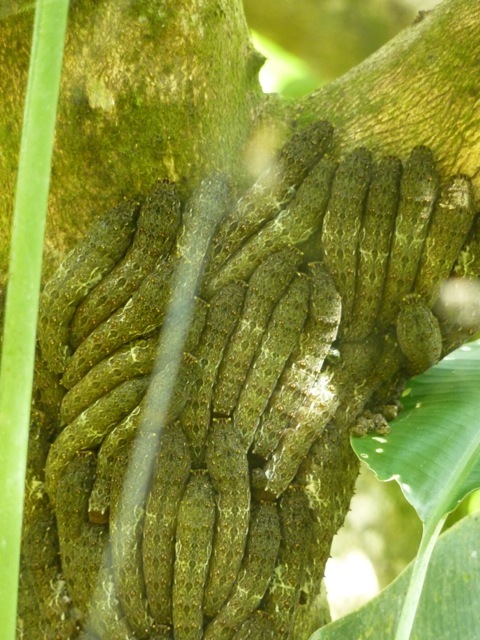 Some species of butterfly larvae...caterpillars...spend time resting on tree trunks in a mass. When they migrate from tree to tree will do a group swarm move. Citrus trees are hosts for swallowtail caterpillars, and they exhibit this behavior. It most likely is a defense against potential predators...the caterpillars are distasteful in general or have some distastefu organs that they extrude when disturbed. Swallowtail caterpillars have stinky antennae-like glands that are extruded when they feel threatened. The caterpillars may be quite well camouflaged while at rest. Your photo looks much like the Swallowtails I frequently see on our mandarines...there are lots of forest trees in the citrus family also that have larvae similar to these. I have seen them in the Amazon basin and also in a migrating swarm in Corcovado. An interesting topic for the nerds amongst us. This experiment shows that the swarm of caterpillars moves faster than does an individual caterpillar...brings me way back to my childhood when I raised caterpillars in my bedroom...nerd heaven. Good link Mayanca for explaining the reason for the collective group moving together. While it may get them where they're going a bit faster I still believe that by aggregating they appear to be a lagrer organism which deters some predation. But they still look like millipedes to me. Maybe we could tell better with a better resolution of photo. This is what swallowtail caterpillars look like at rest on a mandarin tree...They use more than one type of predator defense.. camouflage, mass protection, and nasty taste. Other groups of butterfly and moth larvae are coral snake mimics, bird poop mimics, mimics of toxic insects, covered with urticating hairs, full of cardiac glycosides, all sorts of fabulous defenses. And then....most amazing, they morph into beautiful butterflies and moths. Mayanca, thank you! We and our next-door neighbor have citrus trees, but the swarm was a long way -- several hundred meters away -- from the trees. Amazing behavior, and I wonder how much of this has to do with the lack of toads in our area this year. Maybe no connection, but we've never seen them before. Gayle, years ago, I had saved a photo that I found online... but can't find it or remember if they actually were named...but was fascinated with a similar collective mass ... just like you are! I looked up 'millipede, swarming' and learned that they do swarm, but I did not find a photo of a configuration like in Gayle's photo. Still, that doesn't eliminate the possibility those are millipedes in that photo. I just couldn't tell ofr sure, tho they do look a lot like millipedes. There are many species of millipede and they are of all sizes and colors. I too looked up millipede swarm and what I saw was not anything organized...just random hordes....going in all directions. re: "since these guys appear totally harmless, no harm in picking one up and looking at the number of true legs.... "
What's that saying, an ounce of prevention..... please, use gloves or forceps in your first encounter with the unknown (maybe even safety glasses). Looks can be deceiving. I once thought ants to be harmless, not any more. I , also, as a young'n collected and raised whatever I could catch in the local fields and streams. Al principio, I did not understand my wife's fear of ranas y sapos until I did some research into the local fauna of Costa Rica. Ticos are taught to fear ranas y sapos at a very early age for good reason. Unfortunately, I do know too many people who are afraid of frogs, toads, bats, and even geckos, because of what they have been taught. I have handled virtually every sort of frog and toad in Costa Rica with no adverse effects. This as an OTS student and later teaching Natural History courses in Costa Rica and elsewhere in the tropics. Of course, you are not supposed to lick the Bufo marinus toads or rub your eyes after handling the poison dart frogs, but there is no reason to be afraid of them. (One rare toad in Colombia shouldn't be touched, but it is an exception) Its best to leave them alone, but not be afraid. So many amphibians are on their way to extinction because of habitat destruction, climate change, the infamous fungus, that we need to do everything we can to protect what is left. I well remember being able to find salamanders under almost every rock up on Cerro de la Muerte...no more. The Golden Toad in Monteverde...gone....The beautiful Antelopus frogs...nearly gone. I am much more afraid of what humans are doing to the wildlife then what the wildlife are doing to humans.